blog.HalloweenAdventure.com | Latest News from the Costumes Trend FrontLines! 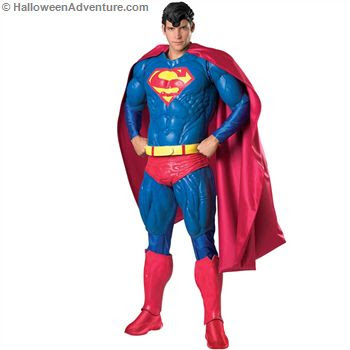 : Prove Your Love for Superheroes with Sensational Collectors' Costumes from HalloweenAdventure.com! Prove Your Love for Superheroes with Sensational Collectors' Costumes from HalloweenAdventure.com! If you think you're the number one fan of the superhero world and you're ready to prove it, HalloweenAdventure.com has a surprise for you! While you'll find costumes to emulate just about every superhero known to man in every size and style imaginable, you may not realize that Halloween Adventure also caters to the more sophisticated tastes of true comic book superhero enthusiasts. So, if you collect comic books, superhero movie memorabilia, or anything else that pertains to the world of superheroes, you're sure to love our impressive selection of superhero collectors' costumes! What are collectors' costumes? Only the most intricately detailed, high quality, impressive costumes on the face of the earth. Collectors' costumes are typically theatrical quality, meaning that they are very similar or identical to the ones worn in films and theatrical productions. And they are considered the Rolls Royce of costume design because collectors' costumes are superior to all others. So, you think you're ready to take a glimpse of these sensational treasures? Well, get ready to be blown away! Simply click on the links below to see the most magnificent costumes in the world! Let's begin our look at the most sensational collectors' costumes of all time with an all time classic superhero! If you love the movies, comics, and TV series, and you consider yourself to be the ultimate Caped Crusader fan, you're sure to start salivating when you see our ultra-impressive Batman Collectors' Costume. This remarkable latex costume includes everything you need to emulate the greatest superhero of all time in superb style and sophistication. While you can expect to pay well over $1,000 for this work-of-art at other costume retailers, you can pick it up for just under $800 at HalloweenAdventure.com! Who can even begin to discuss the world of superheroes without thinking of Superman? If you love high flying adventure at it's finest and the enormous strength of the most beloved superhero of the last fifty years, you're sure to fall in love with our Superman Collectors' Costume. As you look at this stunning masterpiece of costume design, you're sure to realize that your days of terrycloth towel capes and Superman Underoos are long gone but the magic of the moment is still there. Made of durable latex for a more sculpted, authentic look, the Superman Collectors' costume is priced at just under $800 and is a steal for the Superman enthusiast with impeccable taste. Mild mannered Bruce Banner is the Incredible Hulk. This green giant with a behemoth anger management issue has been captivating audiences for decades and if you're a fan, you're sure to love our remarkably impressive Incredible Hulk Super Deluxe costume. If your heart pounds each time you see this marvel of medical science, then prepare to blow everyone away when they see your over-the-top Hulk costume. Made of the highest quality latex available and enhanced with sculpted muscle padding, this sensational costume comes with a massive price tag at other retailers but you can pick one up at Halloween Adventure for just under $1,200! At HalloweenAdventure.com, we stock costumes in a wide array of styles to meet a variety of needs and budgets. So, f you're looking for the most impressive collectors' costumes, there's no need to look any further. We carry collectors' costumes from such monstrously successful film as 300 and Star Wars, as well as the most popular superhero movies of all time. If you have impeccable taste, a yearning for adventure, and an eye for art, you need a collectors' costume to prove to the world that you really are the ultimate action/adventure fan! So, what are you waiting for? Superheroes are hotter than ever, and the hottest collectors' costumes are only a click away!